Let’s be honest, the Southern-Fried Gameroom Expo would not be a very fun show without tons of games to play, most of which are provided by you, our guests. That’s why we’ve committed to offering folks who bring their games to share or sell on our show floor some incredible incentives which can include everything from free entry to early access, t-shirts, and even a VIP party. Now, we’re happy to reveal not one, but two bring-a-game giveaways for this year’s show…ASSAULT and FIREPOWER!!! About Assault: Made by Atari in 1988 through a partnership with Namco, the slim-line arcade game features advanced gameplay with familiar Battlezone-style tank controls. The 360° scrolling playfield keeps your tank front and center while the world moves around you making this a unique, challenging, and fun gaming experience. 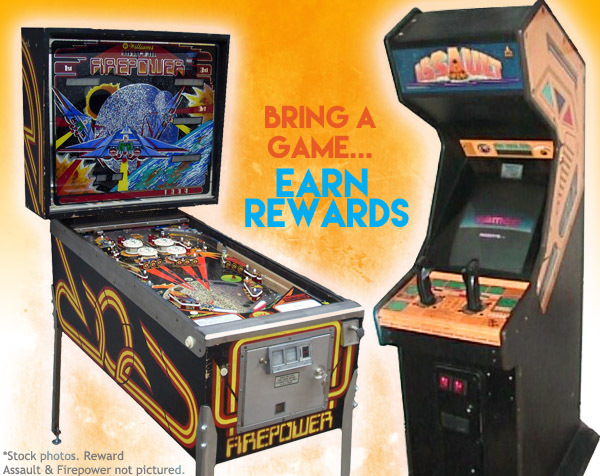 About Firepower: Designed by the legendary Steve Ritchie with sound and software by Eugene Jarvis, the Firepower pinball machine was a revolutionary masterpiece! It was the first pinball machine to feature lane changes, animated displays, and even the first electronic multiball! The game, made by Williams in 1980 set a standard that catapulted an industry! To enter into our Firepower and Assault giveaway, all you have to do is bring a game. For each game you bring, you will receive one entry into our drawing. For example, bring six games and receive six entries into our drawing! We’ll have plenty of other prizes to giveaway as well, so don’t miss out on this fantastic opportunity to bring home a new addition to your gameroom. Don’t wait! SUBMIT YOUR GAMES NOW! !